On a brisk Saturday morning in November, volunteers and area organizations in Austin, Minnesota, were busy getting everything ready for an event to help others in the community. Tables were being set up, groceries were being placed into bags and barber chairs were being brought in for haircuts. Richard Lemons, co-chair of the Austin Poverty Taskforce, the organization that coordinated the event, said he was humbled and overwhelmed as he entered the high school gym where Austin’s first Community Connect event would be taking place. “I was moved by how many people cared and were giving their time to help out,” he said. With preparation underway and going well, Lemons had something else on his mind. 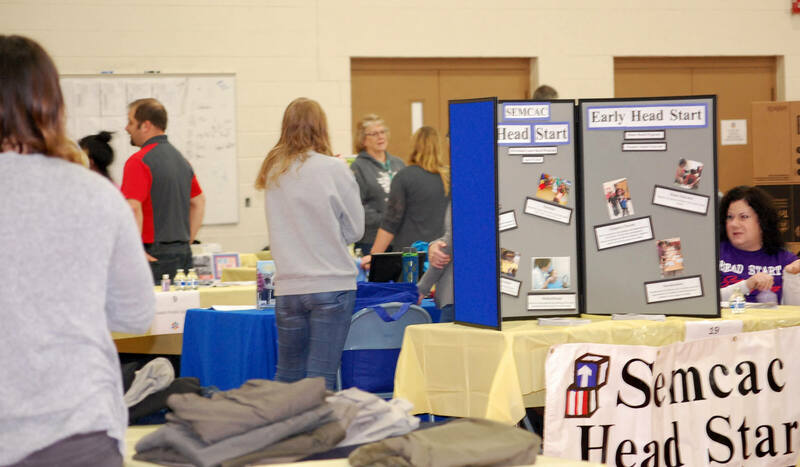 Since it was the first event of its kind in the community to bring more than 40 area organizations together in one place to connect with community members in need, he wondered how many people would attend. He and other taskforce members had hoped at least 300 people would take advantage of the opportunity, but would they show up? Shortly before the start of the event, people began standing in line to enter the gym, and that is when Lemons and others knew it was going to be a good day. According to Lemons, based on federal poverty guidelines and a study by the Austin Human Rights Commission, about one in six people who live in Austin (or approximately 4,000 people) are in poverty. The Austin Poverty Taskforce was formed after he and others from Austin attended community leadership training through the Blandin Foundation, whose mission is to strengthen rural Minnesota communities. During the first year, the group spent a lot of time studying poverty in the community. Members also learned about events, such as Convoy of Hope’s Community Events that Hormel Foods has helped support and other similar events other communities in the area had put on to help others. The event was truly a success beyond our expectations. The goal of the Austin Community Connect event was to bring together as many service providers as possible in a one-stop shop to help inform people about what resources are available and also to provide free haircuts, medical screenings, groceries, activities for kids and a meal. Attendees were appreciative as they walked throughout the gym. “Thank you. This is great what you are all doing to help,” one attendee said as he got choked up and made his way to get a bag of groceries. Another attendee was weeping while getting her haircut; it had been a long time since she had the opportunity to have one. When Lemons asked Hormel Foods for support, the company immediately responded. Since Hormel Foods focuses its philanthropic efforts on hunger, education and supporting communities, the event was a perfect fit. Hormel Foods donated several shelf-stable products for the grocery bags, hot dogs for the meal served at the event and provided a monetary donation as well. Several Hormel Foods employees also volunteered at the event. 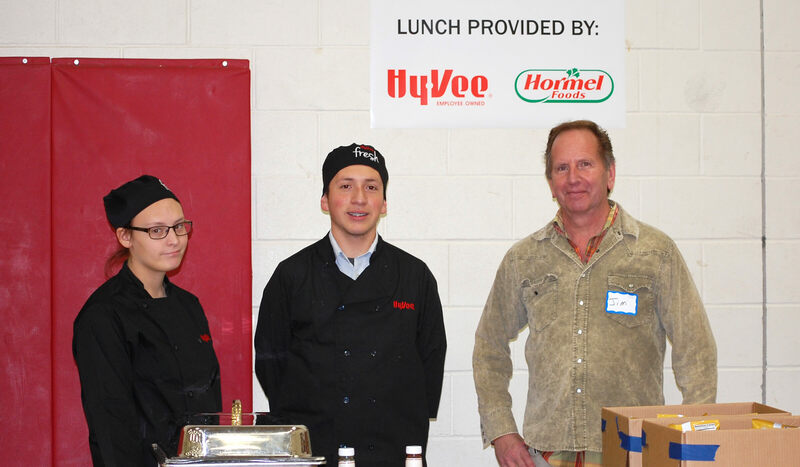 Hormel Foods & HyVee provided lunch and groceries at the event. Services available at the event. 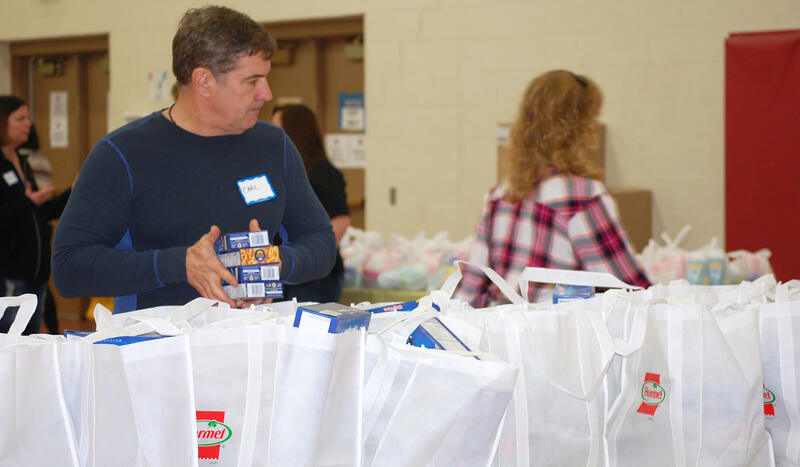 “It was awesome to see our community join forces to ensure those in need have access to the resources that are available,” said Deanna Brady, group vice president at Hormel Foods and president of consumer products sales, who volunteered at the event. 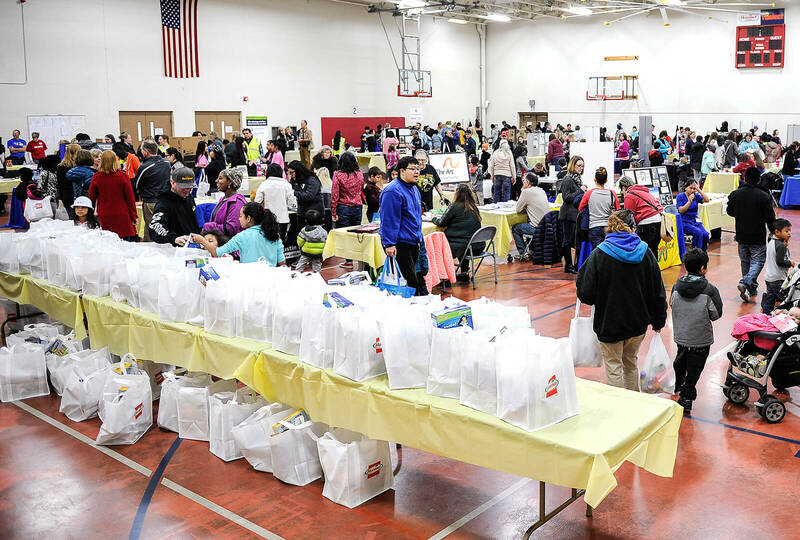 More than 690 people attended Community Connect, far exceeding the goal of the taskforce. In addition, more than 100 individuals volunteered at the event, showing the strong support and engagement of the community. The taskforce will formally analyze the feedback received from the exit survey at the event at its next meeting. However, based on the verbal feedback they received from attendees that day as well as from the volunteers and organizations involved, they are planning to do another one in the future. “Perhaps an annual event,” Lemons said. And you can be sure that Hormel Foods will be there to help.